With these big ol' 460cc geometric drivers designed for forgiveness and a sweet spot the size of Montana, researchers have found that swing speeds are being effected by lots of drag. The Adams Speedline Driver attempts to rectify this problem. The crown of the driver has been reshaped so that the peak height is much higher than topline, and the frontal cross-sectional area is reduced with heel and toe cutouts. 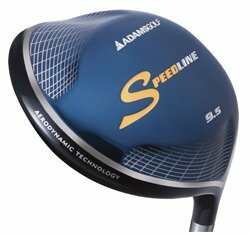 Adams says this driver has "2.5 to 4.2 mph higher clubhead speed and 3 to 9 yards more distance through more efficient airflow around the clubhead." This club still encompasses the high MOI and deep low COG that we've come to expect in our gargantuan drivers. The shaft is a high performance Grafalloy Prolaunch AXIS Blue which promotes a soft, dampened feel and a high ball flight. I would recommend this driver for all skill levels. With 50% less drag, who can resist wanting to swing this speedster? Make sure you get both feet off the ground!